The list of saved phone book entries is displayed. Press the [Download] button to download the call history. Up to 1,000 phone book entries can be copied into car phone book. Upon downloading phone book data, previously saved phone book data will be deleted. 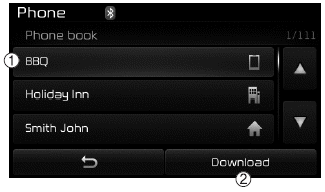 Downloading is not possible if the phone book download feature is turned off within the Bluetooth® Wireless Technology device. Also, some devices may require device authorization upon attempting to download. If downloading cannot be normally conducted, check the Bluetooth® Wireless Technology device setting or the screen state. Caller ID information will not be displayed for unsaved callers.